I actually did not know where I would end up when I started this card. I was using a sketch - but I kept changing my mind about the colors. I am pretty pleased with the end result though. Kinda tropical tutti-fruity, I think. I only used three dies on this card. The doily is from PaperTrey Ink and is just one of my absolute favs. The size is so perfect for lots of projects. 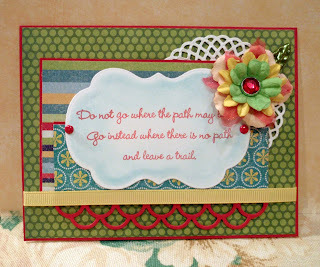 The double border is from MFT Stamps and I think I tend to grab it when I need a fun border. The focal point is cut from the Spellbinders Labels 14 Die set. I used the chalk technique on it to give it some more dimension. I added some brads, flowers and ribbon and decided it was done. Tomorrow I am going to show you a card with a fun new stamp from Stampendous.